How old are your personal care and household cleaning products? I’ll admit that until I had children, I wasn’t all that concerned with what personal care and household products I was using or where they came from. I mean, I should have been. After all, I worked in Supply Chain, specifically consumer packaged goods, and had access to more ingredient knowledge than the average consumer. Naturally, when I had children the importance of better understanding and focusing on the ingredients of those products changed; what is in my toothpaste and all of those bottles of cleaning products under my kitchen sink…where are they made…and how long ago? I only wanted the very best for my babies! Manufacturers don’t want to miss their selected cargo ship, so products are usually complete one to two weeks prior to the Sail Date. Once the products are loaded onto the cargo ship, their transport can take from two weeks to one month. Upon arrival, all products must then be cleared through customs, which can take another three days to three weeks. Products are then typically loaded on to trucks or rail cars for transport to multiple warehouses throughout the U.S. The length of time products spend in a warehouse can be one of the biggest variables; I have seen anything from one month to two years (yes, YEARS! ), and sometimes products never even make it to a store but instead are delivered straight to Grocery liquidators. From a warehouse, products will usually go to a distribution center for specific retailers and then finally, they make it to the shelves in your local store. Best case scenario – products manufactured overseas are usually 4 months old, but realistically, they’re more like 12-18 months old before you they make it to the store for you to purchase them. 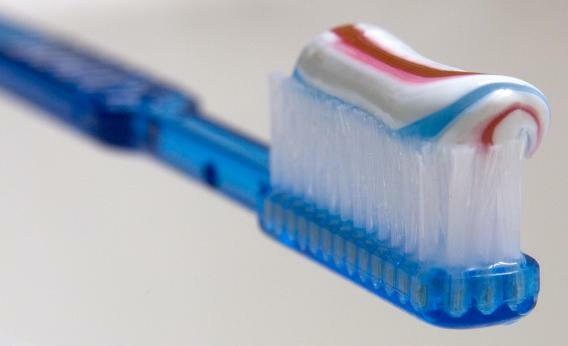 The fluoride in the toothpaste becomes less effective, as it doesn’t bind well to tooth enamel and thus, loses its ability to repel the bacteria in the mouth that causes cavities. Further, the ingredients start to separate (such as the flavoring), so toothpaste becomes quite unpleasant to your taste buds. And sometimes, toothpaste just becomes too dried out and hard to squeeze through the tube. Here is one of the biggest shockers for you – Laundry Soap! Shelf life of liquid laundry soap should be 6 months to 1 year, but because of the supply-chain process many manufacturers are forced to use now, it’s nearly impossible to get in a consumers household before its effectiveness has already started to diminish. Although laundry soap doesn’t technically expire, beyond 12 months, it definitely begins to lose its effectiveness in cleaning clothes. Some liquid laundry detergents have a “best used by” date on the bottle. After this date, the manufacturer cannot ensure that the formula won’t begin to break down and the ingredients separate. This separation is often caused by drastic changes in temperature – excessive heat or if the laundry detergent is allowed to freeze. While you can still use the product (i.e. it’s not harmful), you may find that your clothes aren’t as clean or fresh as they should be. That occurrences such as this happen on a fairly regular basis shouldn’t surprise us. As intelligent consumers, we know that the main reason large U.S. corporations have moved their manufacturing operations overseas to places like China is to reduce costs. What we may not often think about is that those lower costs result not only from cheaper labor, but also from less regulation. And naturally, less regulation often results in toxic ingredients making their way into products we consume every day, assuming that those products from a U.S. company must be safe. Even for those consumers who’ve made a conscious effort to “buy American” and avoid products manufactured in places like China, removing those suspect products entirely from one’s home can be extremely difficult (because sometimes it seems like everything is “made in China!”). We just need to be conscientious about checking the labels on foods and merchandise to see where it came from to protect ourselves and our loved ones. About the author: Jennifer is a mother of two and a former supply chain director. Constantly working and thinking about work which meant valuable time away from her two daughters, she realized her job no longer provided the lifestyle she envisioned. She made a change and joined Moms Making Six Figures. "I now have the flexibility of putting my family first, I still work hard but on my terms, all while earning a significant income." 3 tips for working at home!